It’s hard to believe that Teenage Mutant Ninja Turtles first appeared in May 1984 in comic book form. If that doesn’t make you feel old, I don’t know what will! 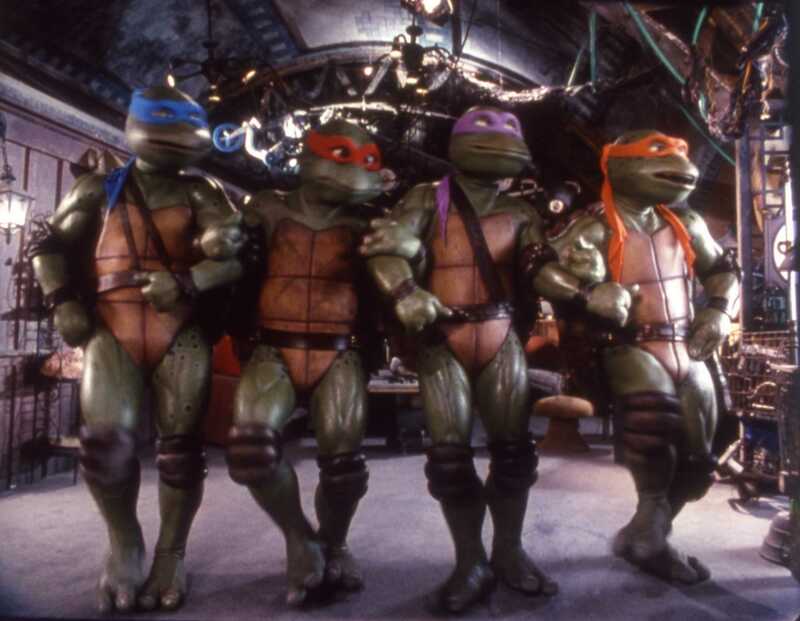 From a comic book to a successful animated series – “Heroes in a half shell – TURTLE POWER!” – and eventually adapted to a live-action feature in 1990, the Ninja Turtles took the world by storm. The merchandise lines were nothing short of crazy – action figures selling out all over the place, numerous video games and every item under the sun. If you wanted it, you could probably get it with a Turtle on. With the reboot on the horizon, there’s no better time to re-release the original movie trilogy on DVD and for the first time in the UK on Blu-ray. Available in a set all together, the trilogy comprises Teenage Mutant Ninja Turtles (1990), Teenage Mutant Ninja Turtles II: The Secret of the Ooze (1991), and Teenage Mutant Ninja Turtles III (1993). What’s it about? 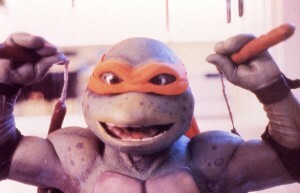 If you’re not familiar with the world of the Turtles, the origin story of Splinter (their mentor/father who happens to be a ninja rat) and our titular heroes is that they get mutated in the sewers of New York City by a radioactive spillage, and that’s where we join them in the first movie. With headstrong news reporter April O’Neil (Judith Hoag) always on the scene, the Turtles soon find themselves tangled in a web of crime and battles against the local Foot Clan, as well as having to come clean to April about their true origins. With their own unique brand of humour and physical prowess, the Turtles look to make New York City a better place by eliminating the Foot Clan and their mysterious leader Shredder (James Saito). With voice artists such as Brian Tochi (Revenge of the Nerds, Police Academy) and Corey Feldman (The Goonies, The Lost Boys), the movie had some impressive star power at the time. Verdict: The first movie has a fairly linear storyline that mixes laughs and action as you’d expect from your typical early 90s movie. NYC makes for an atmospheric backdrop, and the work from Jim Henson to bring the Turtles to life is as wondrous as everything the production company touched. The soundtrack is almost more memorable than the movie itself, with Turtle Power by Partners in Kryme hitting #13 on the US Billboard Hot 100 and #1 on the UK singles chart. There’s no doubting the success of the original Turtles movie making over $200m worldwide on just a $13.5m budget! While it may not be a top-drawer movie in terms of acting quality, it retains the fun and enjoyment all these years later. The Secret Of The Ooze shifts focus to a heavier emphasis on humour rather than the darker undertones of the original movie. Without many weapons, Turtles II instead tends to be rather juvenile and appeals to children more than ever. It’s an understandable change, as the sequel was rush-released to capitalise on the huge popularity of the Turtles at the time, but it makes for a weaker movie overall. Paige Turco replaces Hoag as April O’Neil and two new villains are introduced – Tokka and Rahzar voiced by Megatron himself, Frank Walker. Sadly they ended up as little more than comic relief, especially in a strange Vanilla Ice scene, even if the Ninja Rap is very catchy! While the Super Shredder moment towards the end of the movie is exciting, this is one of very few highlights of an otherwise disappointing sequel. Unfortunately the worst is to come. With the Turtles’ popularity waning, the 1993 final live-action sequel chose to put a twist on their lives by having them travel through time back to Japan in 1603. With a lack of established villains from the comics or cartoon series, Turtles In Time struggles to keep the audience interested and is by far the weakest in the series. You are almost better off skipping it completely and just going back and watching Vanilla Ice on repeat over and over. It’s a very difficult thing to go back and re-watch movies you loved dearly as a child. Things were far easier back then and you were much more easily amused than as an adult! Do the Turtles manage to stand up to their modern-day counterparts now? Not quite. They lose a fair bit but there’s still a certain appeal there, whether it’s Vanilla Ice’s crazy pants or the Henson work. You’ll find yourself smiling from time to time, but equally cringing too. If you’re a die-hard fan then certainly this is a set you need to have in your collection, otherwise it’s a fun trip down memory lane or a quick introduction to Turtles for your young children. 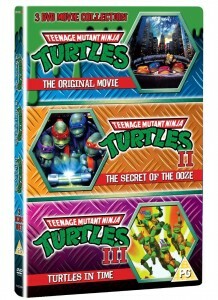 Extras: This isn’t an extras-heavy set, with a documentary on the making of Turtles, as well as some trailers and stills. It would have been nice to have some more insight into the history of the franchise as it’s something that has been going for decades now, but perhaps we’ll see more of that with the upcoming movie. Final Words: There’s no doubt that Leonardo, Michelangelo, Donatello and Raphael deserved their success at the height of their fame, and it’s no surprise they’ll be back on the big screen next year. This set is a fun distraction until 2014 and a real product of the time. No one expects an Oscar-winning movie from a franchise based on talking Turtles, and so if all you want is some fun and laughter then these movies will work well for you. Kids especially will marvel at the way the Turtles move and come to life, and this is a real tribute to Henson’s work. For adults who want to watch these back again, perhaps go in with the mindset that some things can’t be revisited in quite the same way. Bump the score up a notch if it’s simply something to stick on for the kids on a Saturday morning to keep them quiet. Cowabunga dude! 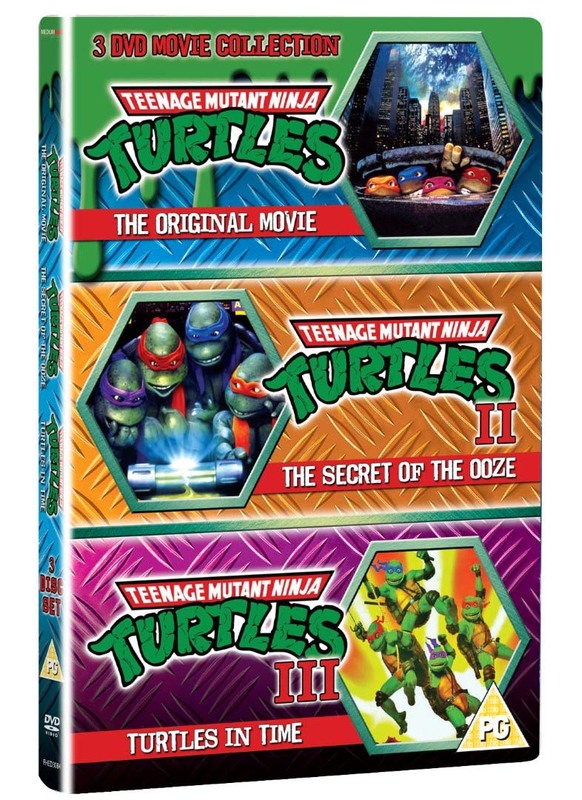 The Teenage Mutant Ninja Movie Collection (PG) is available on DVD & Blu-ray on 28 October.